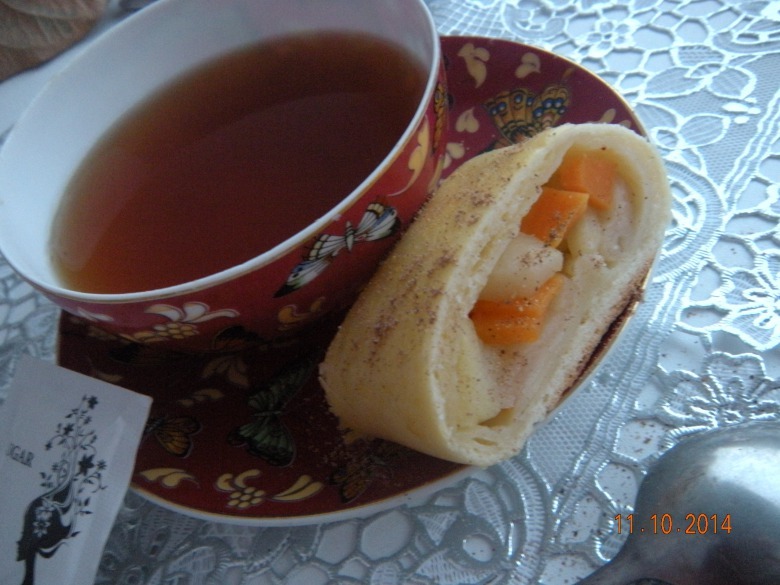 I propose new recipe of rolls with apple and pumpkin. Tasty and useful. Try to cook them. I prepared two came, after visit of my father almost all was eaten and I gave a few slices to my mother, that`s why cooked more today and yesterday did not have time to taste. So, at first prepare dough. I use not the whole egg, leave a bit to smear baking on top. Доки тісто піWhile dough rises, prepare stuffing. Peel apples and cut in pieces, cut pumpkin the same way. Divide dough in 2 parts and roll each in a very thin layer. Spread stuffing on one edge, sprinkle with cinnamon and starch, carefully make a roll. Smear top with egg. Bake in oven to readiness. I cooked for 20 min, dough is very thin, so is prepared very quickly. Once it cools, you can eat it. Top of recipe "Roll with apples and pumpkin"
Roll from pork with pumpkin and nuts! Cylinder "Melody for Two Hearts"
Смакота. Та ще й такий склад чудовий — яблука та гарбузик!